Have the campfire classic your way—easily! 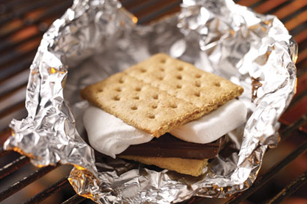 This s'mores recipe offers directions for the microwave, grill and toaster oven. HERSHEY'S® trademark and trade dress are used with permission from The Hershey Company. Heat grill to medium heat. Fill graham squares with marshmallows and chocolate; wrap in foil. Grill 4 to 5 min. or until marshmallows begin to melt. Prepare using 1/2 oz. BAKER'S Semi-Sweet Chocolate.